Avraham "Avi" Cohen was an Israeli footballer who played as a defender. He was best known for his spells playing for two British clubs:Liverpool in England and Rangers in Scotland. 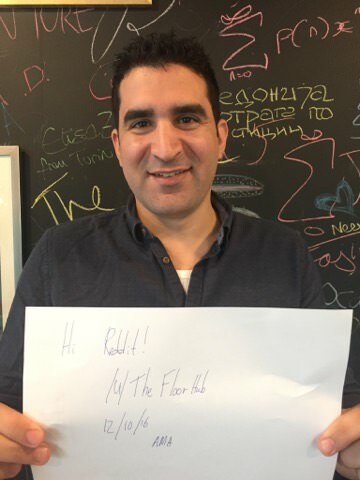 Hi Reddit, my name is Avi Cohen and I'm Co-founder and CEO at The Floor. The Floor is a global Fintech innovation center for six of the world's largest financial institutions. The Floor provides access to solutions for the problems faced by major banks through the use of both in-house R&D and existing fintech startups. Fintech is one of the most exciting fields to be in at the moment and there are all kinds of awesome things happening in the industry every day. We are currently planning an expansion into Asia and would love to answer any questions on that, fintech in general (cryptocurrency, security etc.) or (of course) anything! Since your in fintech, what do you think of bitcoin? Is it a good long term investment? Apart from holding value, it seems to have no other real use compared to the other coins so will it survive the hype to become a legitimate asset? On a larger scale, do you think cryptocurrency could be the future of currency? I mean Sweden is trying to go cashless so is this the same thing? Also are there any issues with cryptocurrency security wise? sorry for the long question. Thanks. Cryptocurrencies (especially bitcoin) have gotten a lot of media attention recently and so it has been thoroughly exposed to mainstream investors. I think that there is a lot of room for investment and for them to do some great things with innovation but I'm skeptical at best for bitcoin as a long term investment. There are definitely many cryptocurrencies that have more utility than bitcoin, but bitcoin is getting a lot of attention at the moment. I do definitely think that we will see cryptocurrencies playing a large role in the economy of the future. Finally, there are definitely some security issues at the moment with some cryptocurrencies but there are also plenty of security issues with banks. I'm confident that, in time, most (if not all) of these issues can be ironed out. Hey, Avi, I was wondering why are you planning on expanding into Asia and where exactly are you going to go? The Floor is choosing to expand internationally, first to HK to be a major player in the Asian fintech ecosystem. Last year investment in fintech in China tripled to $10 billion, representing over 90% of the fintech investment in Asia. There's simply a massive market for us in Asia. With increasing wealth Chinese financial institutions are seeking innovation centers to test new ideas and work with the best fintech startups. This is what The Floor does best. Thanks for the question! We choose the banks that we partner with on a wide variety of criteria but there are a few things that we want from all of our partners. First of all you might notice we've only got one partner bank in each region. We really don't want to have any competing banks because it hinders the collaboration that goes on at The Floor. Otherwise we're also only really looking for the bigger banks in each market, all our partner banks have at least $1 trillion in assets. Hi Avi, just wondering what your background was before the Floor and how that possibly has influenced where you are today? In Israel there is mandatory military service around the ages of ~18-20. I believe that everyone in Israel is influenced a lot by their time in the military, especially because it happens at such a young age. I was part of an elite intelligence unit during my service that is famous for producing very successful entrepreneurs and I think this definitely pushed me towards this career. I was also influenced a lot in by previous jobs where I scouted technology for banks looking to innovate and keep up with the quickly changing world. Hi Avi! How did starting this business go for you? Do you have any advice for someone who's considering pursuing entrepreneurship? The Floor has been a great success for me and just like all start-ups has been incredibly exciting and fast-paced. I think that two particularly important things stand out for me as most important for new start-ups. The first is having good co-founders that work well together. I've been very lucky with this myself, having two very experienced and brilliant co-founders to work with. I also believe that it's very important to have a strong vision and focus with your start-up. Many start-ups fall apart when the founders lose track of what they were trying to do. Is there a particular commercialisation framework or selection of business development tools you like to introduce to the startups you work with? Thanks! We only work with startups selected by our banks, our venture is customer centric - banks set the tone and we deliver the technologies to match their business plans. We support the journey of our startups through business and tech mentorship as well as opening our ecosystem to bring them industry knowledge and expertise for our mature start-ups. What do you mean by play a large role? Do you think cryptocurrencies could ever be used as a mainstream currency or will it only be an obscure investment that is traded for short-term profit? I think somewhere in between. There is definitely a very real chance that in the future cryptocurrencies are used as a mainstream currency, but even if they aren't, that doesn't mean they can only be obscure investments. It is very possible that cryptocurrencies are used in niches they best fill. What would be your advice for somebody considering launching their first-startup? In addition to this how much do you value past industry experience? I answered something similar just before for your first part, make sure you find good co-founders if you're going to start it with someone and make sure that you keep a in mind a good vision of what you want your start-up to do. For your second question: To some extent but I'd like to think that a new way of thinking or challenging of current models is crucial for innovation in the banking industry (and others). However, having been in the industry for many years myself, I tend to draw a lot from my own experience when evaluating new startups. Thanks for the reply that sounds awesome. Do you have a plan to expand further after Asia? Definitely. That is all in the future but there are certainly some markets we plan to expand to in the future. How to you handle cases where an innovation gives a company so much advantage that governments put restrictions on it to balance it out? Do you avoid countries that are prone to it? Sorry! I'm not certain I understand what you mean, could you maybe give me an example of a company that has faced this and I would be happy to answer? Thanks. Interesting! What has changed since your days of scouting new technology for banks? What are banks mainly looking for in fintech these days? Fintech has definitely been growing rapidly since then. Banks are looking for fintech to provide tomorrow's solutions to today's problems. There are some really great innovative ideas coming out of fintech start-ups and banks are looking to utilize the best of them to help them keep up with a rapidly evolving market.